We have dedicated the past two years to transforming our business. During that time, we have quickly built up our market-leading portfolio through internal innovation, as well as through the acquisition of several strategic cyber security companies. Over the last twelve months, we also took a step back to validate Symantec’s corporate responsibility strategy and our approach to disclosure. We re-assessed key concerns of external stakeholders and met with a broad range of internal leaders to inform our thinking. Based on these conversations, we restructured our priorities and reconfirmed our support for the United Nations Global Compact’s 10 principles to protect human rights, uphold ethical labor conditions, protect the environment, and combat corruption. Own it. We set the bar high: In fiscal year 2018, three years after setting an ambitious 10-year, 30 percent greenhouse gas emissions reduction goal, we exceeded it. Additionally, we continued to put the power of online safety in our communities’ hands by partnering with the National PTA to create The Smart Talk, an online tool empowering parents to help their children be responsible digital citizens. Dream it. We foster creativity and diverse points of view: We advanced our strategy to better recruit and promote under-represented talent, foster a culture of inclusion, and drive understanding of the value of diversity, equality, and inclusion. Stand together. We work together to help our employees and communities prosper: Over the past four years, we have introduced more than 10,000 young people to careers in cyber security and fostered the talents of veterans and young adults to address the significant shortage of qualified cyber security candidates. We launched our second signature corporate responsibility initiative, Fostering a Secure Tomorrow (FAST), which brings together world-class products and industry expertise to curb the risks of identity theft for foster youth. It’s fundamental to our culture that we are never done. Fiscal year 2019 will be another important year for Symantec as we continue to innovate and challenge ourselves to drive value for our business and our stakeholders. We remain fully committed to our corporate responsibility efforts, with a focus on boosting employee volunteerism, creating efficiencies in our products and operations, and ensuring our workforce truly represents the diversity of people required to drive innovation. On behalf of the entire Symantec team, I want to thank you for joining us on this journey to build a dynamic and inclusive culture, and a business that makes the world a better, safer place. 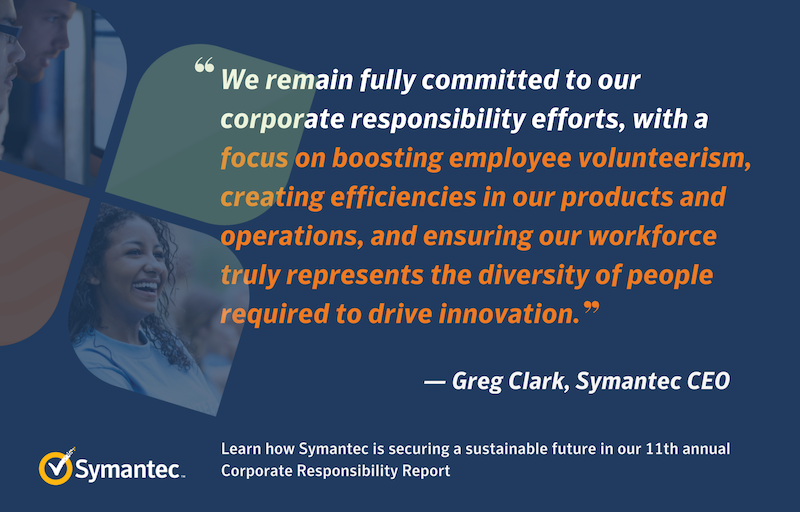 Learn more about Symantec's progress in the 2018 Corporate Responsibility Report.